If you’ve ever read about the salary cap in the NHL, you’ve probably come along the term “escrow.” Upon first glance, it’s not the prettiest of words and when you dive down deeper, it only gets more ugly. Escrow on its own is defined as “a deed, a bond, money or a piece of property held in trust by a third party to be turned over to the grantee only upon fulfillment of a condition,” according to Merrian-Webster. The escrow that plagues salary cap discussions stems greatly off that. In simple terms, the NHLPA (the players) and the owners are ensured a 50-50 split of revenue each season due to the current collective bargaining agreement (CBA). Because player salaries, or their revenue, typically total over that 50 percent, a certain percentage of their salary goes into escrow throughout the year. At the end of the season, the difference between owner and player is paid out to the owners through the escrow money. The players are given back whatever is left in the original money they put in. To read about it in more detail, see this THW article. This season, players were tolled 15.5 percent of their salary for escrow. What they will receive back hasn’t been figured out yet, but in the 2014-15 season when they contributed 15 percent, they received just 2.05 percent back. With free agency just around the corner, escrow will again creep up in discussions and play a big part in salary discussions, but it’s further down the line when escrow will become an even bigger topic of discussion. If it was up to the players, escrow wouldn’t exist for obvious reasons. They’d like to take their salaries home with them and forget about making up the 50-50 split. But due to the agreement, that simply can’t happen. In return, the players have something more to fight for in salary discussions. Taxes already cut into a player’s salary and with escrow, things only get worse. A $3-million salary suddenly cost a player $390,000 on top of taxes at the end of the 2014-15. It’s also important to remember that 15 percent of the paycheck is put into escrow throughout the season. There were 28 weeks during the 2014-15 regular season schedule, and assuming players are paid weekly, a $3 million salary costs over $16,000 in escrow each week. Then when taxes are mixed back in, a hit of over $1 million a year isn’t unlikely if the player has a $3 million salary, according to Gavin Group. 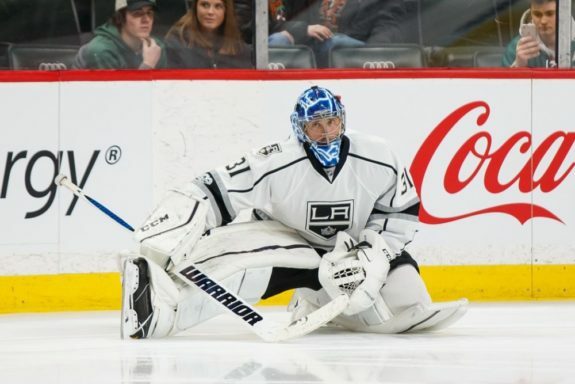 Ben Bishop, one of the more attractive upcoming free agents, just signed a deal with the Dallas Stars at six years with an AAV of $4.9 million. Some felt there were too many years on the deal, but after how much is taken off on escrow alone, it shouldn’t be surprising that players fight for as many years as possible from a team. The players, themselves, awant a cap on escrow, which the NBA has at 10 percent. The issue there is that the owners are guaranteed their 50 percent also. For owners, they need to make sure the players are putting enough into escrow to make up the 50-50 difference. As long as that happens, they know they’ll be getting whatever is owed to them at the end of the season. 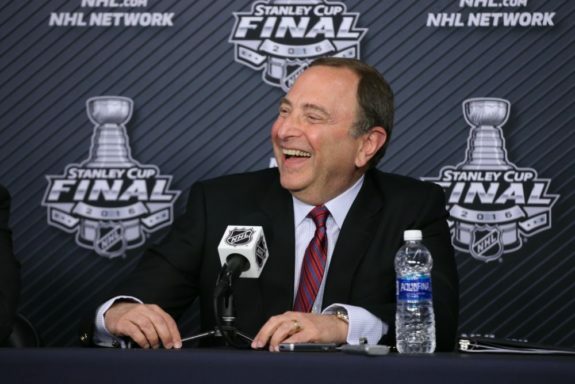 As commissioner, Gary Bettman fights for the owners in labor negotiations. (Charles LeClaire-USA TODAY Sports). The salary cap inhibits how much a team can spend on all of its players and just one player. However, the 50-50 split and escrow guarantees the owners that no matter how much they spend on players, they’ll get their keep. But escrow seems to open a can of worms with owners also. Although they aren’t the ones signing players to contracts, they’re the ones paying them. Whenever their team signs a player to a contract, they do it knowingly that they’ll get some of that money back due to escrow. Suddenly a large paycheck for a player doesn’t seem as bad for the owners. The owners, of course, don’t want a cap on escrow in any form. If they do, there’s a chance they won’t get back the 50 percent they’re ensured in the CBA agreement. A 10 percent cap like the NBA has wouldn’t have covered the differences in the NHL in 2012-13, 2013-14 and 2014-15. While the players would like a cap on escrow, there’s simply no way to do that with the 50-50 required profit split in place. If the owners did not earn their 50 percent, there would be legal trouble for the NHLPA. It’s possible to argue, though, that it’s the owners’ fault if they don’t get their fair share. They are the ones responsible for selling tickets and creating a product that draws people and money to the games, shops and other outlets. For better or worse, though, that’s not the way it’s written in the current CBA. 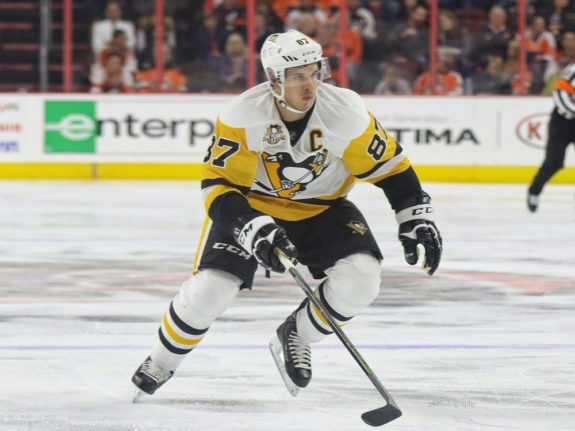 Sidney Crosby and the rest of the NHLPA will have their hands full in 2022. (Amy Irvin / The Hockey Writers). This summer, escrow will be discussed on many different levels. There will be the contract negotiations, what the hit that players take this year will be and what the percentage will be next season. As we keep moving forward, escrow will only grow as a more important topic. But it’s when the current CBA expires after the 2021-22 season that escrow will be at the forefront of the hockey world. If the players fight for an escrow cap, it logically means a change in the half split in revenue, and the owners won’t want to go anywhere near that.